When should I have a septic system inspection performed? Most often a septic system inspection is preformed in conjunction with the purchase/sale of a home; however there are times when an inspection may be advisable. 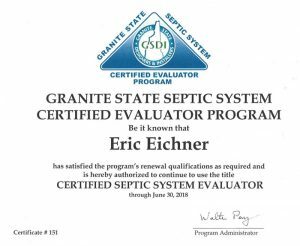 The home I’m purchasing (or septic system at the home) is only a few years old, do I still need to have a septic system inspection done? Yes, having performed hundreds of inspections I have seen some "recent" systems with missing, improperly installed, or damaged components as well as landscaping issues ( surface water directed over a disposal area) or additional fill material added over a disposal area effecting the system's ability to breathe. Should I have the tank pumped prior to an inspection? No, pumping of the tank can remove some indicators of the condition of the septic tank and overall health of the system. A system should be inspected in it's "natural" state when possible. Should I use a septic additive? Commercial septic additives are not necessary. Save your money. The bacteria needed for decomposing solids are naturally present in sewage. Do I need to ever pump my tank? Yes, as sludge builds up there is less residency time for the suspended solids in the effluent to settle out and form sludge. This dirtier liquid leaving the tank ages the disposal area ( "field") quicker. The State of NH Env-Wq 1023.01 says: " Septic tanks shall be inspected for accumulation of sludge and surface scum at a frequency sufficient to allow the tank to be pumped by a licensed septage hauler when the combined thickness of the sludge and surface scum equal 1/3 or more of the septic tank depth." The general rule of thumb is to pump the tank every 3 years. Any good septage hauler should be checking the sludge and surface scum levels and should be able to advise to maintain, increase or decrease the frequency of pumping. The tank was just pumped, can you still perform a thorough inspection? Yes, while pumping the tank may remove some indicators a good inspector can still perform a thorough inspection. When is it time to call the septic inspector? You see muddy soil or pools of wastewater around your septic tank or soil absorption system. You notice sewage smells around your system or inside your house. You experience backups when you do laundry, take showers, or flush the toilet. Refer to our Tips and Pointers page. A properly designed, sited, and installed, septic system can last for many years with proper maintenance. Pump as needed (usually every 2-3 years depending on family size and usage). Be careful of you put down the drain and flush down the toilet. I am experiencing backup issues from my septic. Do I call a plumber or a septic professional? Information is free, call and ask me. If you want to do it yourself start by taking a look at the waste water lines in the basement to see if they ALL exit the home from the same pipe or if there are multiple outlet pipes. If there are multiple outlet pipes and they are located away from each other then most likely some fixtures in the home are directed into a grey water dry well; however there are times when an addition has been put on a building the multiple lines may all go into the septic system. Once you have determined if you have one (or more) exit pipes, determine if the backup is caused by all the fixtures in the home or just some. If there is only ONE exit pipe and only SOME of the fixtures cause a backup then the issue is inside the home and a plumber should be called, if ALL the fixtures cause the backup a septic professional can open the tank and determine if the issue is in the system or the piping to the system. The most common cause of a backup is a "paper jam" from overuse of toilet paper. Never remove the cleanout cap inside your home if you are having a backup- an unpleasant relief of the backup may occur! If there are Multiple exit pipes try to determine which fixtures are causing the backup and which exit line they tie into. Again, if it is a Single fixture causing the backup the issue is inside the home and a plumber should be called. If it is ALL the fixtures then determine (as best as possible) if that exit pipe leads to the septic system. If the toilets are connected to this line then it is the septic line and a septic professional can open the tank and determine if the issue is in the system or the piping to the system. If the backup occurs in an exit line without any toilets connected to it and it exits the home on a different side than the septic tank is located it is most likely a grey water dry well that is no longer accepting waste water. There are multiple reasons a grey water dry well may stop accepting waste water- crushed/restricted pipes to the dry well, root invasion, or a failed dry well.